I purchased this B1-6 in the early spring of 1977 from a co-worker who used it for several years doing custom tilling. At one time he and his father had two of these machines. I bought this machine because I needed something to work my 5,000 square foot garden, it was in running condition, and the price was right at $75. Included was another machine minus the engine, wheels, and tiller hood. These tillers came in two tilling widths, 20" and 26". With the pick tines, the B1-6 and B1-7 will till 9" deep. Over the winter I refurbished the engine and transmission. Every piece was disassembled. All bearings, bushings, and seals were replaced. The cylinder was bored .040" oversize because of severe scoring. 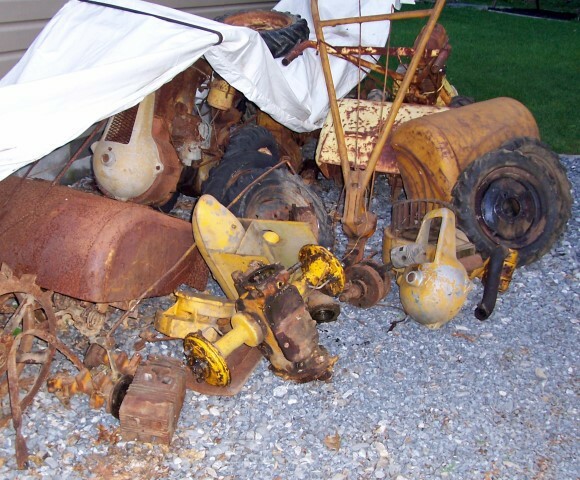 At the time Frazer Farm Equipment in Auburn, Indiana was my major source of parts and technical information. They bored the cylinder and did the fitting of the piston. During the winter months of 81/82 I refurbished the tiller section. After all these repairs were made, I painted it with paint purchased from Frazer Farm Equipment. 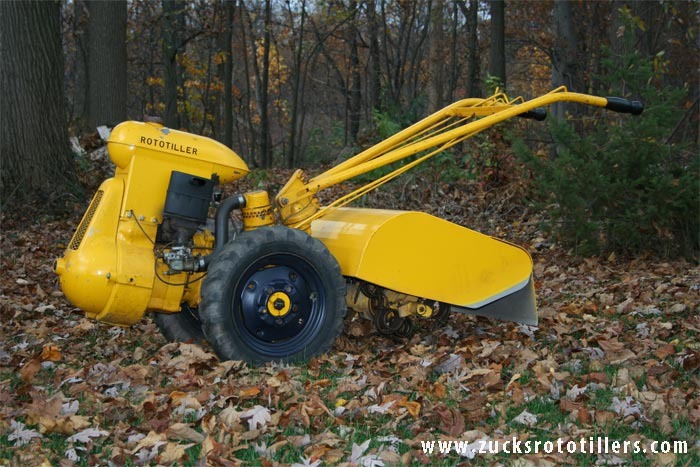 This machine then was used in my 5,000 square foot garden until about 1990. It was then that we gave up gardening. The garden area was reduced and used for growing sunflowers, wildflowers, field corn, millet, etc. Basically my son turned it into a small bird habitat area. The Rototiller didn't get too much use after this. I use what is left of the garden to "play in the dirt" with my tillers to help keep them in good running condition. These tillers are commonly known as Frazer Rototillers because of Kaiser-Frazer's involvement. 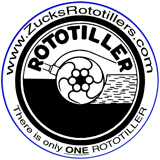 Rototillers were sold at their car dealerships. These machines were expensive with a suggested retail price of around $435, which was probably close to the price of a vehicle in 1946. 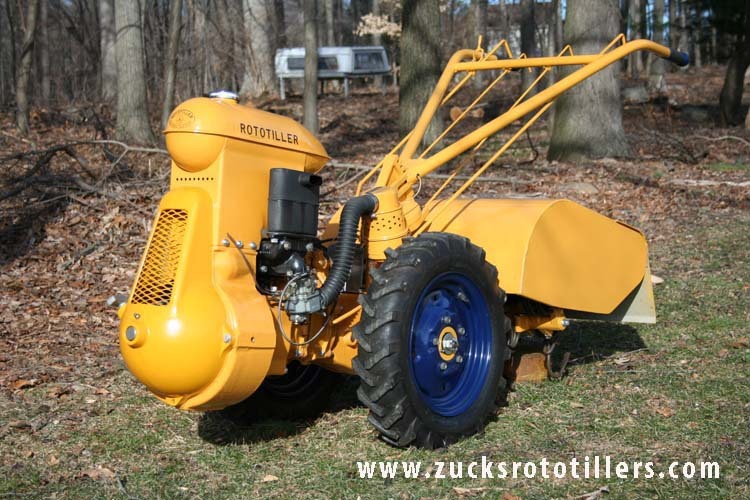 Visit Donald's Antique Rototillers website for more on these tillers. Two excellent books are Gardening Beyond the Plow by Garden Way Inc. and Donald Jones' book entitled The Rototiller in America. Many pieces that are restored have special stories and this one is no different. 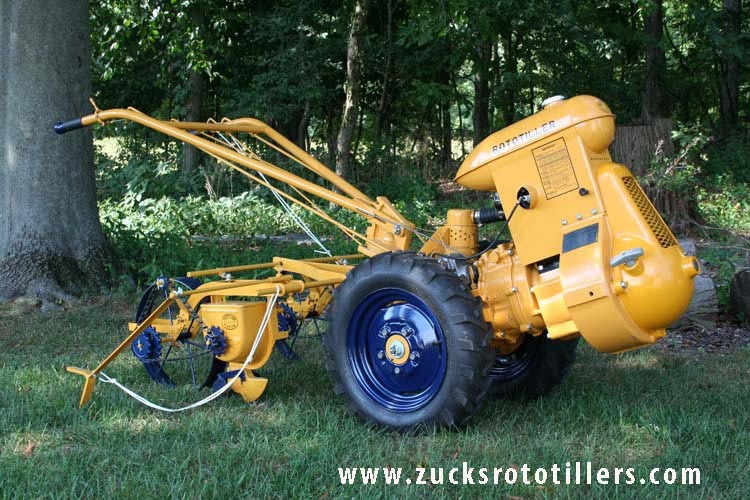 Back in 2010 a gentleman emailed me concerning parts he had for Frazer Rototiller. I bought several items from him and a little while later he emailed me again concerning larger, heavier pieces he still had but did not want to scrap. He wondered if I was interested. Of course I was, but really did not want to pay the postage that it would require. He said he was headed down past where I lived on vacation and would drop the stuff off at my house. There ended up being parts for a complete machine. Much of what he delivered was actually from one machine. Right away there were a couple things that I had not seen on machines that I had bought over the years. This one was an early serial number and it had a cast iron squirrel cage cooling fan and manual lock out wheel hubs that at the time I did not know were an option. In the photo are the pieces that the gentleman delivered. I put most of the stuff aside in my storage area. Some time later I sent the cylinder to my friend in Auburn to bored and fit a .030" oversize piston. It would be years down the line until this project was completed. I retired in 2013 and finally in 2015 started to work on this project. It became a two part project when I acquired a two row planter made for this machine. I decided to add a reverse gearbox to the tiller to make it easier to maneuver and load on my trailer. I was fortunate to have acquired all new internal parts for the gearbox. I completed the painting on the tiller hood the beginning of 2016 in time to take it to an indoor show in February. In the meantime I started working on the two row planter that was made by Danville Manufacturing for Graham-Paige. The planter was labeled B-54. The planter was NOS, but had been stored for maybe fifty years or more in a damp building. Everything had to be bead blasted and repainted. I needed a photo of the decal that was on the planter because mine was too deteriorated. Bob Due in Knoxville, TN has a planter with an excellent decal that he was gracious enough to photograph. From that photo I made the graphic in PhotoShop and made my own decal. Bob has the largest collection of walk behind rototillers and you can check out his website here. One thing about the Danville planters - the seed plates are very expensive and hard to find. Unfortunately there were no plates with my planter.